The Forestry Rights Project supports NGOs working together to prevent or mitigate negative impacts of Economic Land Concessions (ELCs) on forest-dependent communities and promotes alternative livelihood options for them. Read more here. The Indigenous Peoples’ Land Rights Project supports NGOs to secure indigenous peoples’ land and protect their communities by preventing or mitigating the negative impacts of development projects and economic land concessions (ELCs). Read more here. The Land Security Project supports NGOs advocating for improved land tenure security and better land dispute resolution mechanisms, to benefit the poor and vulnerable. Read more here. The Resettlement and Housing Rights project supports NGOs to encourage authorities and developers to provide sufficient information on new projects to affected communities, and to consult with them before development starts, to minimize the negative impact of new developments, land grabs and resettlement. Read more here. The Programme’s advocacy approach is based on two foundations: constructive engagement and evidence-based research. Constructive and respectful engagement rather than confrontation seeks to build bridges with the government, development partners and stakeholders. Engaging with the government builds relationships, seeks mutual understanding of decision-making processes, procedures and the respective priorities of each party. Another approach is leading strategic thinking through policy and policy options based on research. The advocacy work of the Programme is based on field investigation and research to provide reliable, verifiable and credible information to stakeholders. The Programme is planning to work more closely with community-based organisations like CPN and farmers’ organisations to establish closer links with NGO Forum networks and engage them in advocacy campaigns. Emergency assistance will be provided to stakeholders in poor and female/female-headed households that are involved in land conflicts. Research projects will monitor the trends that are disadvantaging the poor and vulnerable, especially women, in land disputes, compensation, forced evictions, land registration and in areas close to Economic Land Concessions. The Land and Livelihoods Programme was established by NGO Forum in 2004 to respond to growing concerns about land issues. It was aligned with existing projects working to protect the rights of forest-dependent peoples and communities facing involuntary resettlement. The Indigenous Peoples Rights Project was added to the programme, and in 2006 the Research Information Centre began operations as a support unit to the Programme. Network members rated the Land and Livelihoods Programme as important in influencing and promoting land rights, particularly land tenure security, the protection of rural property rights and community access to land registration. Policy makers and development partners valued the work of NGO Forum through the Programme as a positive contribution to the process of effective land registration and tenure security. NGO Forum helped to coordinate land advocacy to influence government and donors to adopt pro-poor land policies in government and donor strategies. Improved participation of NGO/CSOs in policy development has led to improved legal protection of the rights of the poor and vulnerable. The governments’ participation in conferences and workshops has increased and enabled the opportunity for the government and affected communities to discuss issues directly with each other. NGO statements submitted to the Government Development Partner Coordination Committee (GDCC), Cambodia Development Cooperation Forum (CDCF) and on the National Strategic Development Plan (NSDP) are highly regarded by donors, and the NGO Forum has an excellent reputation, and therefore potential to influence policies. 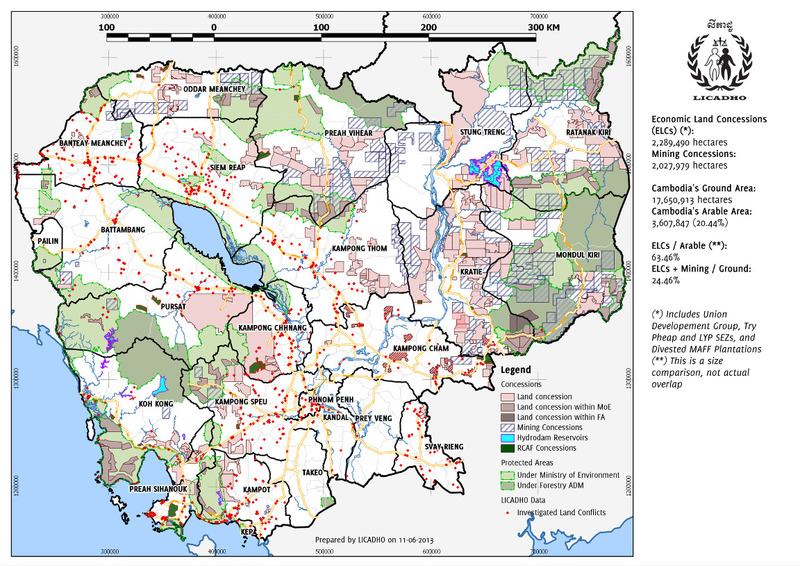 According to the human rights organisation LICADHO, economic land concessions (ELCs) covered 2,289,490 ha by June 2013 – equivalent to 63% of Cambodia’s arable land. In addition, 2,027,979 hectares of mining concessions have been recorded. Thus, according to LICADHO, both types of concessions together cover 4,317,469 hectares or 24% percent of Cambodia’s surface area. Due to the extended lease times of 70–99 years, this land will not be available for rural communities for farming and cultivation to support food security in the foreseeable future. Map courtesy of LICADHO.